We're thrilled to announce that Dalahäst Coffee Roasters have joined the Peterson Farm family under the management of Kaitlyn Bentley! Many of our customers have come to love this locally-roasted coffee and we're so excited to continue to grow Dalahäst. 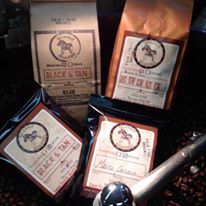 In addition to offering Dalahäst Coffee for sale at Peterson Farm, coffee will continue to be available at various locations around the community. If you haven't tried Dalahäst Coffee yet, come down to Peterson Farm and pick some up to try today!